USAF Catalina 44-33915 "Sophisticat" served with the 5th Emergency Rescue Squadron of the 8th Air Force based in the UK at Suffolk in WWII, their main duty was to rescue allied airman shot down over the North Sea. Additional information about the Catalina G-PBYA Graphic: This beautiful 1943 Catalina has been restored to it's former glory in the UK and is operated by Plane Sailing, it's painted to represent USAF 44-33915 . 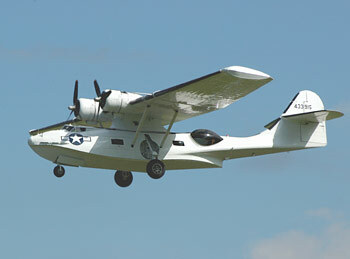 Siteseen Ltd. are the sole copyright holders of this Catalina G-PBYA picture, unless otherwise stated. We only authorise non-commercial picture use and particularly encourage their use for educational purposes. This Catalina G-PBYA picture is not in the Public Domain. 3) Use of this Catalina G-PBYA picture, or any of our pictures on websites re-distributing copyright free material is strictly prohibited.